You should also carefully deliberate the amount of insurance coverage that you need. Available options, limits and coverages vary by state. 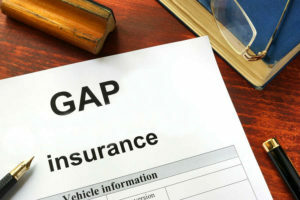 Each state has different requirements and laws when it comes to uninsured motorist insurance. Be sure to ask an agent in our office about these coverages if you’d like them. Contact us today! Being in an accident can be a very frightening event. Being prepared to know how to handle the situation when it occurs will help you deal with the shock of it, as well as ensure you are covered for the loss when it does happen. While accidents will happen to almost every driver, whether their car is parked and unattended, or while they’re driving, knowing these important steps will help you deal with the unfortunate situation. Safely park your vehicle: If you happen to be driving when the accident occurs, safely pull the vehicle over to the side of the road. If possible, carefully write down the license plate and description of the other vehicle(s) involved in the accident. If you are reporting a hit and run, this information will aid police in locating the driver. In the event of a hit and run it most likely happens when your vehicle is unattended. If you return to your vehicle to find damage, look for clues to help you prove your case, i.e. Security cameras. Call police: Once you’re safely parked, you should call the police to file a report, especially if another party is involved. It’s important to always have documentation of how the accident happened. Some people want to settle the claim without going through insurance, but this comes with risks. The other driver may not live up to their word and without contacting the police, it turns into a he said, she said scenario. Exchange Information: Exchanging insurance ID cards is always recommended. Be sure to have their name and phone number too. It’s simple to take a picture with your phone. Be sure to include the car’s license plate number, year, make and model too. Take pictures/Gather any witness information: If you have a witness who wants to share their side of the story, jot down their phone number and name. Your insurance company will want to talk with any witness to the accident. 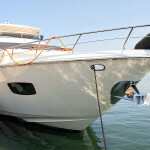 Taking pictures also gives your insurance company more details on the damage of your vehicle. 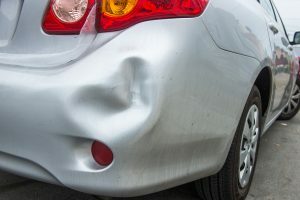 Call your insurance company: Sometimes even though vehicles collide, the damages may be limited, so you’ll want to take a close look and determine if you want to pursue a claim or get an estimate first before calling your insurance company. If someone was injured or if you have major damage, it’s always best to call your insurance company immediately. Your insurance company can assist you with your claim so if you have taken pictures and provided all the information above, your claim can be settled quicker. 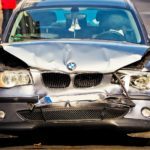 While we hope you never have to experience a car accident, being prepared will help you tackle the unfortunate situation. If you have questions about your auto insurance, call the insurance agents at Hukari Insurance in Beaverton, OR. We have years of insurance experience and can help you insure everything from your home to your auto or motorcycle. We live where you do and are an independent insurance agent, so we can help you find the right company to fit your needs. You can also check out our website, 24/7. The local, independent agents at Hukari Insurance Agency can assist you with adding or amending an existing policy or setting you up with a new policy. Our years of insurance experience can save you a bundle. You can also visit our insurance website 24/7 to learn more about auto insurance or the other insurance products they offer like motorcycle or home insurance. If you have questions about your home or renters insurance, call the insurance agents at Hukari Insurance in Beaverton, OR. They have years of insurance experience and can help you insure everything from your home to your auto or motorcycle. They live where you do and are an independent insurance agent, so they can help you find the right company to fit your needs. You can also check out their website, 24/7. 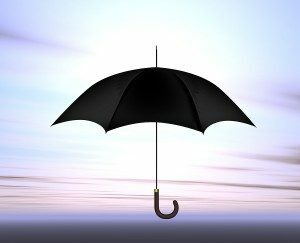 There are many scenarios that would warrant the need for an umbrella insurance policy. We outline a few of them here. Example #1: Your teenage daughter is babysitting the neighbor kids and leaves the house for a moment to run to the store. When she returns, one of the children is badly injured and requires surgery. The child’s medical bills exceed $300,000. The parents of the children sue you to cover the medical bills. Example #2: Your son dislikes his gym class as well as the teacher. He goes on social media and writes some very reproachful comments about the teacher that leave him in a bad light. The teacher sues and is awarded $500,000. Example #3: Your 17 year old child decides to pick up some friends and go “cruising” in your car. He loses control of the vehicle while showing off how fast the minivan is. Each child is critically injured. Your umbrella policy helps cover the medical bills. Example #4: You invite friends over to your home to celebrate the 4th of July. You provide all the entertainment, food and refreshments, including alcohol. One friend who is known for drinking too much, does just that, gets in his car and drives home getting in a terrible car accident that kills one person. The family sues you and you’re found to be liable for serving the friend too much alcohol. Example #5: Your rental property’s deck is rotted and your tenant falls through it badly injuring their leg and requiring reconstructive surgery. A jury awards the tenant $750,000 for damages. Example #6: You host a wedding on your property and rent a bouncy house. The house is not staked down and blows away in the wind with children inside of it. The kids are fine, but you’re sued for negligence. The families of the children are awarded $100,000 each for mental and post-traumatic stress. Example #7: Your dog gets out viciously attacks the neighbors show dog. The dog can no longer show because it has scars and a limp. You’re sued for loss of income and a jury awards the dog owner $450,000. Example #8: You’re the “cool mom” and agree to buy your kids and their friends alcohol if they promise to stay at the house. One of the friends leaves the house and is killed in an accident. He is found to be intoxicated. The parents of the child sue you for providing them with alcohol. A jury awards $2 million. There are countless situations that can occur and exhaust your current liability limits on your home or auto insurance policy. The good news is that umbrella insurance policies are relatively inexpensive. Contact an agent at our office for your personalized umbrella insurance quote today. Hukari Insurance discusses the four common driving emergencies and how to work through them. Driving hazards present themselves daily and can occur year-round in every state. But, would you know what to do in the event a driving hazard presented itself? Stay alert: if you are driving in rural areas, be aware that wildlife is always nearby and keep a lookout towards the sides of the road. 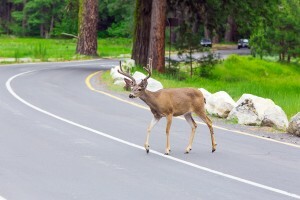 Don’t swerve: Swerving cannot only results in a worse injury and more severe accident, but your insurance company might find you at fault if you swerve to miss a deer and end up hitting a tree or guard rail. Keep your car pointed forward and hit the brakes! Be more aware at night: Animals can become more active in the evenings and some travel in groups. If you see one, chances are there are more nearby. If there are two lanes, drive in the lane farthest away from the side of the road. Don’t slam on the brakes: Slamming on the brakes with a blown tire will only make matters worse because it will cause your vehicle to pull hard in the direction of the flat. Slowly pull to the side of the roadway, as far away from traffic as possible. Work to maintain your steering: If a front tire blows, it can really cause the vehicle to pull. Do your best not to overreact to the sudden jolt and swerve the other way. This could cause your vehicle to lose control. Place your blown tire and wheel under the car slightly when changing your tire: So many injuries occur when a jack is improperly used. Placing your tire under the car can save you from being crushed if a jack fails. Bugs in the Car: We’ve all experienced the spider in the car! Pull over: While a spider or bee in the vehicle can be alarming, you have to remember – it is probably more afraid of you than you are of it! Carefully pull over to the side of the road and let your unwanted passenger out. Don’t let it take your eyes off the road: It can be tempting to try to swat at the insect or arachnid while driving, but don’t. It will only increase the chances of causing a more serious crash. Let off the gas: Many vehicle have stability control and will work to auto-correct the problem. Stop accelerating and let your car recover. Let off the brake: Applying the brakes on ice can unfortunately make matters worse. Never slam the brakes on, but gently apply them. Drive slowly: if you notice the temperature beginning to plunge, drive more slowly. Less accidents occur when drivers keep the speeds under 45 MPH during icy conditions. While we can’t always be in the car with you to avoid hazards, we can help you with your auto and home insurance questions. Fall is one of our favorite seasons! The leaves, the cooler, shorter days and of course, pumpkin spice everything. There are some seasonal dangers associated with fall that can be quite hazardous if one is not prepared. Knowing what these dangers are and how to anticipate them can mean the difference between a lovely, relaxing fall and having to file a potentially costly insurance claim. The Road: A drive to see the fall colors can be relaxing and enjoyable for all. You should be aware of changing weather conditions. Fall brings rain, wind and fog. Standing water on the roadways can create a slick, ice-like surface making it difficult to control the vehicle or hydroplane. If you happen to be in an area where leaves are falling, the leaves have a similar ice-like effect on the car. Another potential danger while in the car is fog. Fog can seemingly roll in from nowhere and impede your ability to see road hazards like traffic, debris, etc. For all these dangers, the best course of action is attentive driving. Reduce your speed, increase your following distance and stay alert to changing conditions. The Wind: The winds returns, sometimes with a vengeance, during the fall. The wind can blow cars around the road and debris into the road, so during an episode of high winds, be alert to debris that may be entering the roadways. Trees and tree branches can also be a hazard. Trees that are diseased or branches that are low-hanging can become dislodged and cause massive amounts of damage to homes, garages and cars. The best way to try and stave off falling trees and branches is to trim all low-hanging branches that reside over dwellings. If your neighbors have tree branches that sit over your dwellings, work with them to get the branches removed. Also, if you suspect your trees to be diseased, have them inspected and removed. The Water: A gentle fall rain can be soothing, but let’s be honest the rain in the fall tends to be more torrential. Fast moving storms can overwhelm storm drains (that could already be blocked with leaves or other debris) and the oversaturated ground cannot absorb the water resulting in large amounts of standing water or a flash flood. Remember that a standard homeowner’s insurance policy does not cover outside water entering your home due to rain or flood. If you live in an area that is prone to flooding, having sandbags on hand in case of a storm could be the difference between just mopping off your front porch and filing a flood insurance claim. With a little preparation, you may be able to avoid an unpleasant situation and a costly insurance claim. The insurance experts at Hukari Insurance in Beaverton, OR can assist you with setting up policies like auto insurance, home insurance and flood insurance. If you have questions about your current insurance policies or about the potential fall dangers in the Beaverton area, give your Hukari agent a call. You can also visit their insurance website 24/7! We wanted to know what some of your biggest grips about those other drivers you share the road with. After tallying our unofficial poll results, we compiled a list of bad habits behind the wheel. Blinkers: Not using a blinker topped the list of annoyances on the road. Using a blinker allows other motorists to know where you intended to merge, turn or otherwise move. It gives your fellow commuters a chance to slow down to let you in/turn, etc. Not using a blinker and then moving your vehicle could cause those around you to slam on their brakes potentially causing an auto accident. We all forget every now and again, but make sure to use that blinker. Merging: There were several gripes surrounding merging. Most agreed that not allowing other cars to merge into traffic was not very nice and also hazardous. Allowing traffic to flow onto the freeway may prevent an auto accident. Also on the merging gripe list is merging at a speed too slow or too fast could cause other drivers to react which could lead to an auto accident. Aggressive drivers: In many states, driving aggressively can lead to a hefty ticket. Drivers who tailgate, weave in and out of traffic and speed excessively put not only themselves at risk, but other drivers, etc., around them as well. Distracted drivers: These days there are many things that can distract you while driving a vehicle. Shushing kids, minding pets, texting or talking on cell phones, self-grooming, eating, drinking coffee and playing with the radio are all things that can distract you from your number one task – keeping your eyes on the road. Whether you are on a major interstate or a country road, it only takes a moment for a vehicle, animal, child or debris to get right into your path. If you are not paying attention to the road, your reaction time could be minimized and it could lead to an auto accident. Share the road: Not only do we share the road with other drivers, we share the road with cyclists and pedestrians. In some areas cyclists have dedicated lanes, but they are afforded the same “right-of-way” privileges as pedestrians. When driving in an area frequented by cyclists and pedestrians, you need to be hyper-aware of your surroundings as they can seemingly pop out of “nowhere.” While the burden of an auto accident may fall to the vehicle, all parties have a duty and responsibility to look out for themselves and each other. Cyclists and pedestrians should make the direction they are heading clear, and cyclists should use the proper directional hand signals. Driving is a privilege and requires the utmost responsibility when behind the wheel. We all have bad days when we are rushing to get to our destinations, mad at the driver in front of us or just in a daze. Snapping yourself out of those moods may help prevent an auto accident or injury. If an accident does occur, make sure to get the appropriate information from all parties involved and report the claim to your insurance carrier. If you have any questions about your auto insurance coverage, don’t hesitate to ask the experts at Hukari Insurance in Beaverton, OR. Your local, independent insurance agents can walk you through what may or may not be covered by your current auto insurance policy and help you decide if additional coverage is right for your situation. They can also assist you with a personal umbrella policy. You can visit their insurance website 24/7 for more details. In the moments after an auto accident there are a million things that will run through your head. Checking yourself and other passengers for injuries is probably the first thing you do followed by visually assessing the damage to your vehicle. 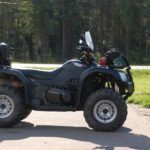 Your next steps may make the insurance claims process a bit easier, so learning these steps prior to an accident may trigger your memory should you find yourself involved in an auto accident in Beaverton, Oregon. Call 911: Always alert law enforcement to an auto accident whether it is single or multiple vehicles, on private property, etc. The 911-dispatcher will ask a series of questions to determine if an officer is needed, usually if there is significant vehicle or property damage, there is an injury or if impairment is suspected. If an officer is not needed at the scene, make sure to file a police report at your local precinct as your insurance company may need a police report in order to process certain claims. This process also works for claims such as theft, vandalism or hit-and-run damage to your vehicle. Gather information: You will need to collect information from any parties involved in the auto accident or information from someone whose property may have been damage by your vehicle (and vice versa). Make sure to get a phone number, address, auto insurance company and policy number, a description of the vehicle (make, model, and year) and a description of the damage done to the vehicle. If you have a smartphone or camera handy take photos of all vehicles, buildings and surrounding areas. Make sure to photograph vehicle positions, street signs and anything else that may be useful in the claims process. 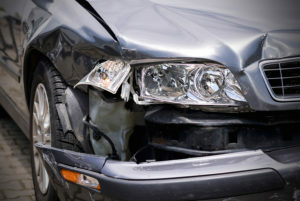 Talk to your agent: Alert your agent to the fact that you have been in an auto accident and let them know the details. If it is a smaller, solo accident without significant damage to your vehicle, it may be cheaper in the long run to avoid an insurance claim and pay for the damage out of pocket. Your agent can guide you through your options and help you make the best decision for your situation. Your agent may also be an advocate for you when dealing with the insurance company of any party that was involved in an accident with you. File a claim: If you and your agent have determined that filing a claim is the best option for you, then your agent can assist you in that process. Provide your agent with the information of anyone else involved in the auto accident, any photos or videos that were taken at the scene and if there is one, the police report. Your agent will start the claims process and send out a claims adjuster to assess the damage to your vehicle and let you know how much the damage will cost to repair. This does not necessarily reflect the amount you will pay, that depends on who is found “at-fault” for the accident. The waiting game: The claims process can take a bit of time, especially if there are multiple parties and multiple insurance companies involved. Check in with your agent and feel free to ask any questions you may have about the process. We always hope that none of our clients will experience the stress of an auto accident, but we know that it happens (that’s why we’re here!) The local, independent agents at Hukari Insurance in Beaverton, OR can assist you in filing a claim and finding a reputable repair shop. They are right in your backyard, so they know the most trusted repair shops in Beaverton, Oregon area. Their years of insurance experience can save you a bundle. You can also visit their insurance website 24/7 to learn more about auto insurance or the other insurance products they offer like Classic Car or RV insurance. Time to break out the conical hats, black cat decorations and the pumpkin seeds; Halloween is on its way! Whether you intend to go all out and build a spooky scene in your front yard complete with a giant spider and web or if you plan to put up a few jack-o-lanterns you can take some extra steps to ensure that your Halloween spirit does not turn your home into a personal house of horrors. To avoid a costly homeowner’s insurance claim in Beaverton, OR, such as a fire, property damage or a personal liability claim, make sure that your Halloween decorations and any area that party-goers or trick-or-treaters access is free of debris and tripping hazards. Décor: Many Halloween decorations are made of paper or wood products. Keep these decorations away from open flames and away from lights as the décor could spontaneously combust resulting in a fire. Lit jack-o-lanterns should be extinguished prior to going to bed or leaving the house for an extended period of time. A pumpkin that is too dry or a flame that is too close to a wooden porch could spark a blaze, which if not caught quickly could be quite destructive. To eliminate open flames altogether, try flameless LED candles. Speaking of lighting, make sure that any lights hung are the appropriate type (indoor or outdoor) and that they are strung in such a way that no one could trip over or get tangled in. Tripping Hazards: Little ones (and adults too!) can get over excited during a scare and could hurt themselves on décor that is not properly secured or in the way. Moving items like porch furniture or lawn décor could help prevent accidents outside. If you plan to throw a Halloween party indoors with little ones, make sure that sharp edges and corners are secured and tripping hazards such as side tables or ottomans are out of the way. Taking a few extra steps to ensure that your guests are safe could save you from a costly personal liability claim. Treats and tricks: Another wonderful part about Halloween is the food! Candy corn, lollipops and caramel apples are delicious treats for young and old alike; however they do present a choking hazard for small children. Make sure that bite-size or chewy treats are kept out of reach of tiny hands. Halloween can be a fun time for friends and family, not a time to worry about household accidents. If you have any questions about what your homeowner’s insurance policy covers in terms of fire, property damage or personal injury liability, your licensed insurance agent in Beaverton, Oregon can assist you. The local, independent agents at Hukari Insurance can assist you with examining an existing policy or setting you up with a new policy. Their years of insurance experience can save you a bundle. You can also visit their insurance website 24/7 to learn more about auto insurance or the other insurance products they offer like personal umbrella insurance.